Early last week I posted something about boxer Gene Tunney’s 1940 visit to the Theodore Roosevelt Birthplace on the TRB Facebook page. I had stumbled across a photo of Tunney at the house on East 20th Street while reading old RMA bulletins at the New York Public Library a few weeks previously. It turned out serendipitously because I had just completed Rex Passion’s The Lost Sketchbooks. Passion wrote text to go along with artist Ed Shenton’s drawings from the Great War. Shenton’s experiences included training in the Sweet Science while at Camp Hancock just outside of Augusta, Georgia. A little digging into the story reveals that over three million doughboys boxed as part of their training and preparation to fight in France. Those three million included Shenton–and Gene Tunney. The Commission on Training Camp Activities had created and implemented the idea. 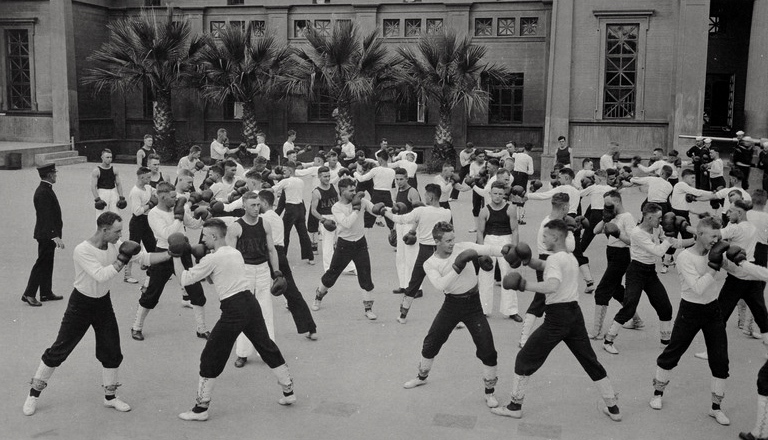 They even produced a training film consisting of highlights from the bouts of such fighters as Gentleman Jim Corbett and Kid McCoy to show doughboys the proper technique. Keep in mind that moving imagery was still a fairly new medium at the time. It might well have been the first film many of these young men had ever seen. The training program was so successful that in the months just after the war’s end the Knights of Columbus organized an A.E.F. tournament in Paris. This all came to pass in early 1919 with Tunney, a U.S. Marine at the time, walking away with the title. Soon, like all Americans marines and doughboys, he returned to the United States and civilian life. Less than a decade later he would beat Jack Dempsey and become heavyweight champ. He retired undefeated in 1928. Tunney had come to the TRB in 1940 to help Franklin Delano Roosevelt in the upcoming presidential election. FDR was still wildly popular but many were upset that he was violating the then unwritten rule that presidents step down after two terms. Tunney and FDR, I recently discovered, went all the way back to late 1918. Roosevelt, in his capacity as assistant secretary of the navy, had made sure that the young marine could stay in Paris and train for the A.E.F. tournament. The two remained friends. He campaigned for FDR in 1932 and, obviously, continued doing so in ensuing elections. Fascinating! TR was quite a boxer, too. He was. I’m going to have something coming on that later this coming week. I have loved my time at the TRB so much.